By 2012 per the Marpol6 global regulation, ships are restricted to Sulphur emission of 1% in ECA areas and 3.5% in Global areas. By 2015, Sulphur emission must be reduced to 0.1% in the ECA areas. Those areas outside ECA must reduce the sulphur emission by 0.5% by 2020. In order to comply with these regulations, the Shipping Industry has started to search for options to reduce the Sulphur Emission. One of the available options is the use of scrubbers. Scrubber systems are a diverse group of air pollution control devices that can be used to remove some particulates and/or gases from industrial exhaust streams. Traditionally, the term “scrubber” has referred to pollution control devices that use liquid to wash unwanted pollutants from a gas stream. These Scrubbers are directly installed on the ships. There are several methods to remove toxic or corrosive compounds from exhaust gas and neutralize it and hence there are different varieties of scrubbers. 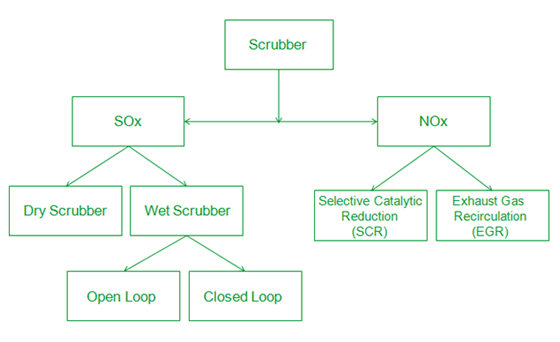 Scrubber can be classified by their use and the method they use to remove particulates. The main advantage of scrubbers is the continual use of the cheaper bunker fuel than low sulphur fuel and thereby reducing the switching cost to an entirely new fuel system. With these advantages scrubbers seem to be an ideal solution, but not all vessels are suitable for scrubbers and therefore retrofitting is required. The price of retrofitting a single vessel is estimated to be around $3-5 million per ship (Guidance to INTERTANKO Members for the Selection of Compliance Alternatives July 2012). One side effect of scrubbing is that the process only moves the unwanted substance from the exhaust gases into a liquid solution, solid paste or powder form. This must be disposed of safely, if it cannot be reused. Scrubbers can cut only one exhaust at a time (i.e. SOx or NOx). Consequently, it has to be emphasized that scrubbers will not be able to match long term MARPOL6 deadlines, requiring a drastic reduction of both SOx and NOx. Also, if the sulphur content in the fuel is more than 3.5% then the elimination of the SOx is not 100%. In the past year, some ship-liners have invested in scrubber technology. But still there are other ship-liners which have turned towards LNG or shore connection in seeking a solution to the emissions problem. The latter solution provides deeper environmental benefits by cutting all emissions (SOx, NOx, CO2 and PM), noise and vibration to zero in ports where ships emission causes the most health issues. Meet environmental regulations with shore connection solutions for ports and ships. To learn more, visit our Shore-to-ship web area or get a preview of the ShoreBoX from our video. Hi Lorène, very interesting information about the scrubbers technology, thanks! As additional information I think it is interesting to add that not any scrubbers system in the market can be integrated on any vessel. The compatibility of the particular system needs to be validated by the vessel motor(s) manufacturer, which means the ship owner is not free to create a customized system, but needs to adapt to the motor manufacturer’s list of validated scrubbers systems. Can you, and anyone in the scrubbers industry, confirm / comment on this? Thanks! In addition, approvals from classification societies may also be required! In my experience the exhausts from the ships generators don’t go through the scrubbers anyway, its only the Main Propulsion that does. Therefore when the ship is at berth the scubbers don’t make any difference. The scrubber technology sounds great for the ships for reducing the emission of sulphur. But I think only integrating scrubber system in the vessels won’t solve all the environmental issues. More important is that shipping companies follow all the environmental regulations. Wave Marine shipping company is one company that follows all environmental rules. It is very informative information, thanks for sharing with us.